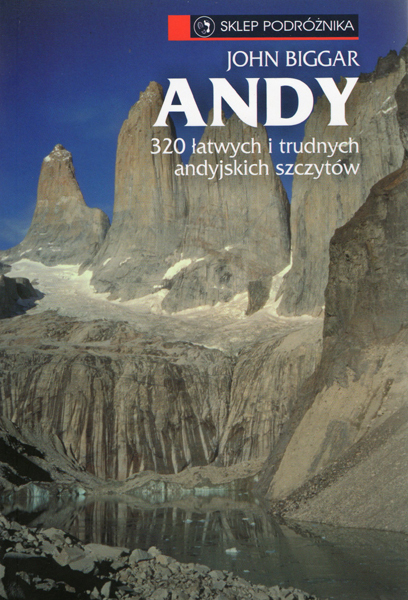 "ANDES" publish and sell unique guidebooks to the Andes. In collaboration with our Belgian partners Nevicata, Polish partners Sklep Podroznika and Czech partners Nakladatelstvi, these have now been translated into four other languages. The current editions of our guidebooks, available in English as both paperback and E-book, are described in more detail below. The "Buy Now" buttons take you to the PayPal payment page on this website where you can buy the paper editions. 4th English edition published March 2015. € 45.00 includes airmail postage. US$ 55.00 includes airmail postage. E-book of the 4th English edition was published in November 2015. Available as both .epub and .mobi file formats from Amazon, Kobo and I-tunes. 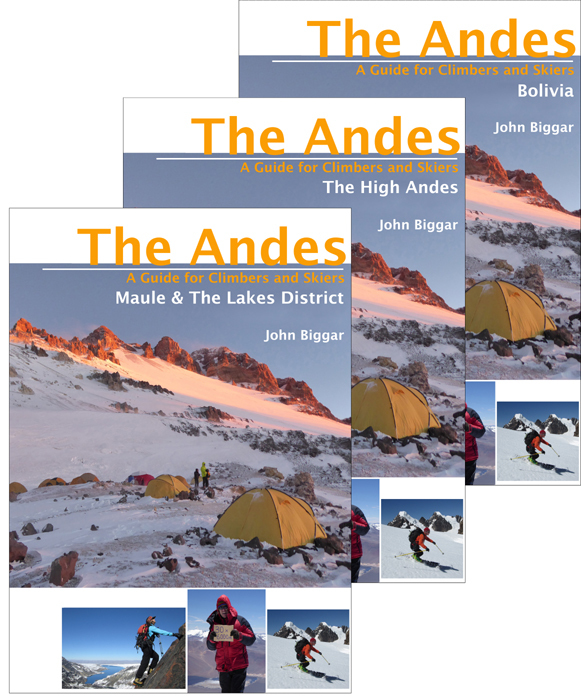 Search online for "Andes Guidebook John Biggar"
Before purchasing an individual chapter please check the chapter list below to ensure you buy the correct area. € 34.00 incluyendo correo aereo desde Escocia. US$ 49.00 incluyendo correo aereo desde Escocia. Please select the book you wish to buy and where in the world you want it sent to (UK, Europe or Rest of the World). Then click on the button to be taken to the secure PayPal website to pay and process your order. For further information about PayPal please visit www.paypal.com You may want to read the Small Print about returns etc., at the bottom of this page, before purchasing a book from us directly. 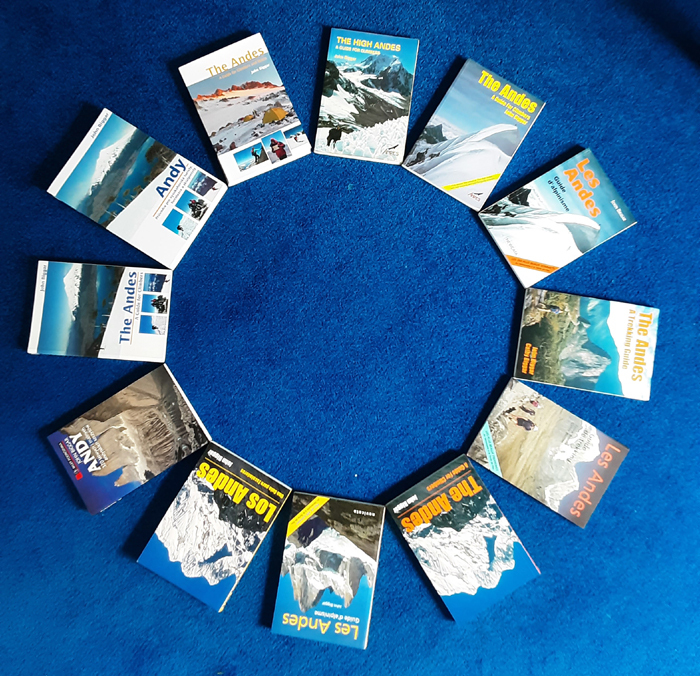 The 11 paper editions of our guidebooks to the Andes. Plus two (unseen) E-books! I have an errata page highlighting the few typo's and other errors discovered in the most recent editions of these guidebooks since publication. Ahora tambien tengo una pagina de errores en Español / Castellano para la edicion de 2007. 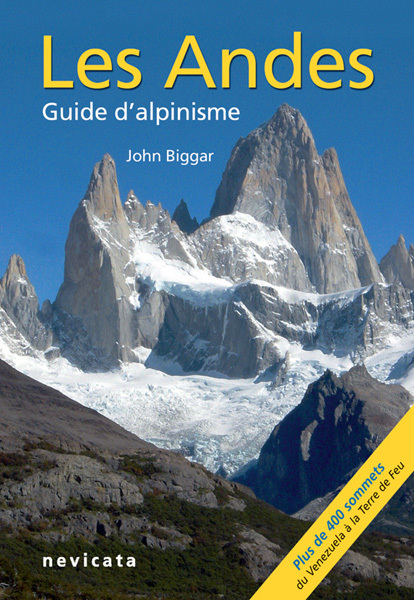 "ANDES" are the publishers of the only comprehensive climbing guidebook to the Andes- 'The Andes' by John Biggar. 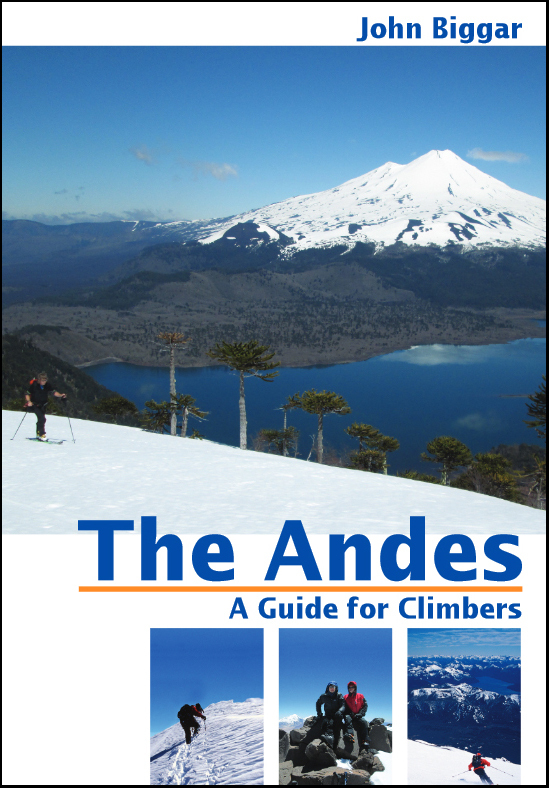 'The Andes - A Guide for Climbers' is the only comprehensive guidebook to the peaks of the Andes. It is the only guidebook to cover all one hundred 6000m peaks of South America. There is also information on many other 5000m peaks plus details of many of the most prominent Patagonian peaks. Packed with photos, maps and route diagrams this 4th edition has extended coverage of ski-mountaineering in the Andes. "a must have for anyone planning to climb in South America"
4th edition review in the Alpine Journal 2015. 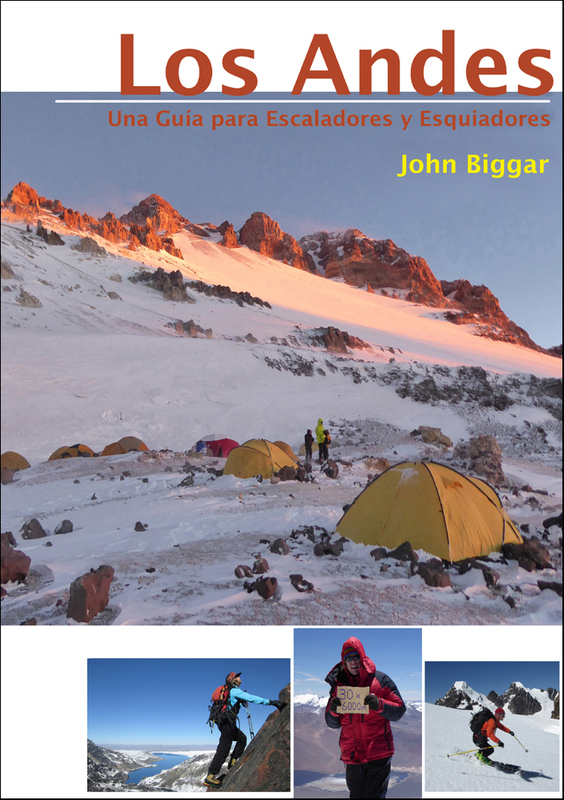 In association with Primento "ANDES" also publish individual E-book chapters from "The Andes - A Guide for Climbers" by John Biggar. Chapters from the 4th English edition, published November 2015. ECUADOR 978-0-9934387-1-4 All the 5000m peaks in Ecuador and a good selection of the 4000m peaks. This chapter includes famous peaks such as Cotopaxi and Chimborazo. NORTHERN PERU 978-0-9934387-2-1 All the main 5000m and 6000m peaks in the Cordilleras Blanca, Huayhuash, Raura, Central, Viuda, Huaytapallana. This chapter includes famous peaks such as Alpamayo and Huascaran. SOUTHERN PERU 978-0-9934387-3-8 The main summits of the Cordilleras Urubamba, Vilcabamba and Vilcanota near Cuzco. The Carabaya and Aricoma, plus the Peruvian side of the Corillera Apolobamba. This chapter does not cover the volcanic peaks around Arequipa, which are in the Cordillera Occidental chapter. BOLIVIA 978-0-9934387-4-5 All the Bolivian Apolobamba, plus the Cordillera Real and Cordillera Quimsa Cruz. This chapter does not cover the volcanic peaks on and near the Chilean frontier, which are in the Cordillera Occidental chapter. CORDILLERA OCCIDENTAL 978-0-9934387-5-2 The volcanic peaks around Arequipa in Peru and then running down the Chile/Bolivia border to Licacncabur near SanPedro de Atacama. All the 6000m peaks are covered plus the majority of the higher and more prominent 5000m peaks. PUNA DE ATACAMA 978-0-9934387-6-9 Peaks on or near the Chile/Argentina frontier from Pili in the north to Veladero in the south. All the 6000m peaks plus many 5000m peaks from 23ºS to 28ºS. This chapter includes well-kent peaks such as Ojos del Salado and Pissis. THE HIGH ANDES 978-0-9934387-7-6 Peaks on or near the Chile/Argentina frontier from El Toro in the north to Sosneado in the south. All the 6000m peaks plus many 5000m peaks from 29ºS to 35ºS. This chapter includes well-kent peaks such as Aconcagua and Mercedario. MAULE & THE LAKES DISTRICT 978-0-9934387-8-3 Peaks on or near the Chile/Argentina frontier from Peteroa in the north to Cerro Catedral near Bariloche in the south. All the major 4000m peaks plus many 3000m peaks from 35ºS to 41ºS. 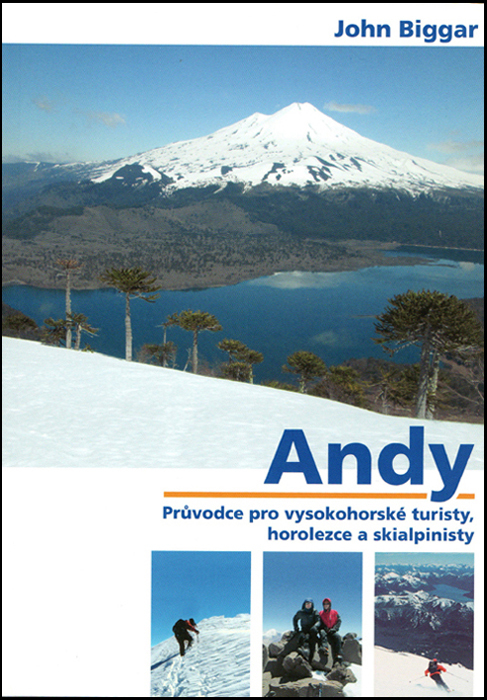 This chapter includes information on skiing the southern Chilean volcanoes. PATAGONIA & TIERRA DEL FUEGO 978-0-9934387-9-0 Peaks on or near the Chile/Argentina frontier from near Bariloche to Cape Horn All the most prominent peaks are covered. Les grandes voies de montagne et les sommets de trekking. Plus de 350 sommets des andes et de Patagonia. Des milliers d'informations uniques.83 cartes, 120 croquis et de nombreuses photos couleur. Vous pouvez commander des exemplaires de ce guide directement a l'adresse si vous ne trouvez pas chez votre libraire. Los Andes - Una Guía para Escaladores by John Biggar. Traducido desde la 3ra edicin Ingles por Pere Vilarasau, Cecilia Vazquez y John Biggar. La primera edicion Español (tercera edicion Ingles) de esta unica guia completa de los picos de los Andes. Los 102 picos de 6000m descritos, mas de 210 picos y mas bajos descritos. 350 fotos, incluyendo mas de 160 diagramas de rutas y 84 mapas esquematicos en color. "..sucintas descripciones de las rutas generalmente normals, ... y unos planos de aproximaciones y accesos elaborados con mas detalle dan forma a una guia para una primera visita a los Andes"
Revista de la primera edicion Ingles, Desnivel, Enero 1997. Please note that "The Andes - A Trekking Guide", ISBN 0-9536087-1-9 is now out of print.... they've all gone! A Czech Edition is in preparation for publication in 2018, by Czech publishers Nakladatelstvi Junior s.r.o. Direct Book Sales - The Small Print. 1. You are purchasing your guidebook directly from the author and publisher John Biggar t/a ANDES, 37a St Andrew Street, Castle Douglas, Kirkcudbrightshire, DG7 1EN, Scotland. Telephone 00 44 1556 503929. John Biggar is the sole proprietor of ANDES. 2. We'll accept returns if your book is damaged or faulty in some way, or has been damaged in the post. In this case we will replace the book and refund your return postage costs. Please phone or email first to arrange a return. 3. If you simply change your mind about owning the guidebook you have purchased from us within 14 days of receiving it we will refund your money (when you return the book to us!!). Return postage in this case is at your expense. Please phone or email us first to arrange a return. For the benefit of Google and other search engines here are some really bad ways to spell my name -- Jon Biggar, John Bigger, Jon Bigar.